Lamb shanks like to be cooked on a low heat for a long time, but I flash bake them on a very high heat to seal them before the slow-cooking process. Crank your oven up to very high temp and allow 10-15 minutes for it to get hot. 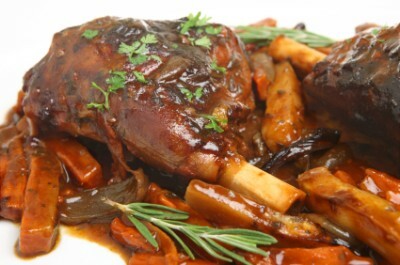 Brush the lamb shanks with a tablespoon of the oil and place them in a deep roasting tin. When the oven is very hot, place the lamb shanks in to seal for about 15 minutes. Meanwhile, in a large saucepan; fry the onion in a tablespoon of oil on a medium-high heat until it begins to soften slightly, add the garlic and all the veggies and keep stirring. Take care not to burn the garlic or it will taste bitter. Once the veggies have begun to brown, add the stock, rosemary and sugar. Bring to a boil and reduce to simmer. Salt to taste. Your lamb shanks should have a nice seal on them by now. Carefully remove the hot roasting pan from the oven. Reduce the oven heat to low - around 120 degrees Celsius (250 degrees Fahrenheit. Add the stock and veggies to the roasting tin and seal the whole lot in 2 layers of cooking foil. Slam in the lamb and slow-roast the shanks for at least 2 hrs 30 mins and no more than 4 hours, by which time it will fall off the bone. Carefully remove the lamb shanks to a deep serving dish. Now mix the remaining oil with the flour and add it to the stock and veggies, stir to thicken over a medium heat. Allow it to simmer for a minute and pour over the lamb shanks. Salt and pepper to taste and garnish with a sprig of rosemary. I like to serve these one shank per person on a bed of mashed potatoes, with a little mint sauce on the side. Looks good. Sounds good. I'm going to have to put it to the test to find out whether it tastes any good!